These are not my book shelves. Really? Do people really use books that are kept like this? Do these tomes have stickies jutting out like porcupine quills marking favourite passages? Do these books hold evidence of unscheduled snacks that helped the reader through that “last chapter” before making dinner? Have any of them been with the owner for so many years they can’t remember the written birthday greeting on the inside cover from “Diane”. Diane who? What birthday? It makes me wonder when those books were last touched. However, I chose that photo because at least it’s holding some foreign objects that don’t relate to anything other than life. The catcher’s mitt probably belonged to the owner as a kid. The tennis racket, the old dinosaur and the airplane probably hold memories that couldn’t be put in a box. Speaking of boxes, I bet those boxes on the shelves didn’t fit anywhere else in the house. Here’s why I’m focusing on book shelves. Our local Literacy Club collects books from residents and puts on a monster book sale to raise funds for their literacy programs. So far, I’ve donated at least 10 bags of books. Most of those bags held a minimum of 10 books. Yet, my bookshelves still don’t come close to that photo posted above. I didn’t think I’d ever do this, but I’m going to come out of the “untidy bookshelf closet” – knowing some of you are superb home decorators. I’m swallowing my pride with great difficulty so I can reveal the small dint my donation made in my book shelves. 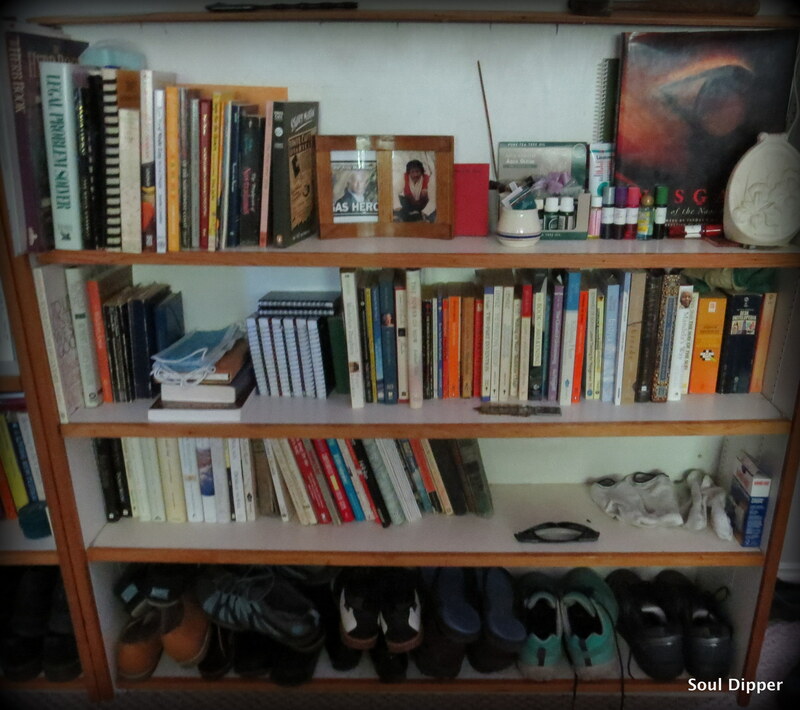 At my house, you can see how my books love company – look at those shoes. At night, I’m certain the shoes report their daily travels to bored books. Socks stay close to their favourite shoes to make sure no details are left out. The shoes like keeping band-aids close by – no guilt when heels are chaffed. A round, green “quickie” shoeshine gismo sits on a shelf near the shoehorns. For diversity, there’s safety glasses, dust masks, essential oils, incense, photos, virtues cards and many “earthy” objects d’art. 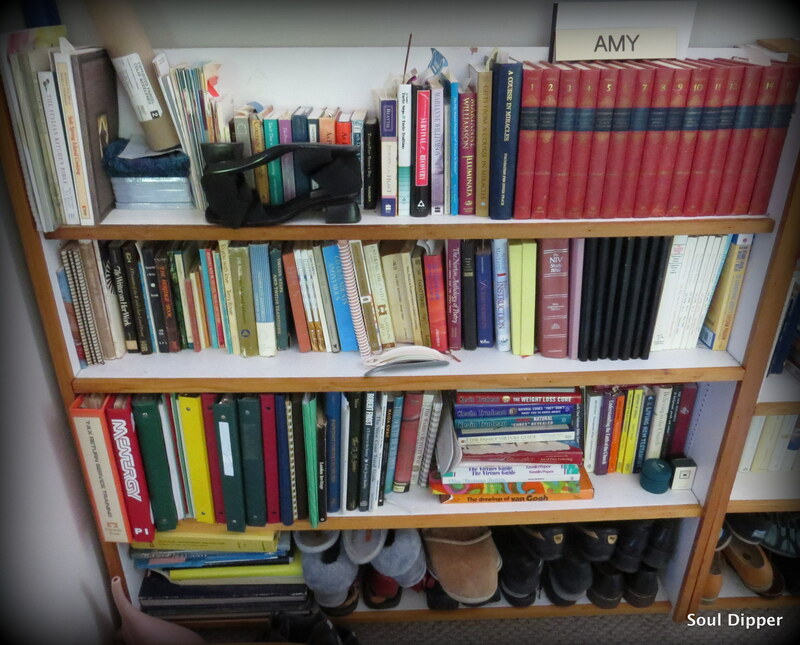 On the extreme left, there’s binders holding materials and notes from various courses studied over the years – nutrition for the body and soul. Journals sit in out-of-date-order that my women friends MUST destroy if I’m found to be incompetent or gone. They’re written in code in case those women don’t fulfill their promise. Actually, all named parties are safe. I changed the code so often over the decades that even I can’t decipher my entries anymore. This particular set, published in 1964, served as my literary internet for many years. I confess to having two other stashes of books. One is mostly reference books for writing; the other is filled with a highly diverse selection of pleasurable reads. These are the newest members of my library and be damned if I’m going to give them up right now. I haven’t considered a Kindle yet. I provide a pill popping service to Duc le Chat three times a day which keeps me from significant traveling. If I go “kindle”, do I forgo the experience of sorting through books that are destined to serve some greater need? I’ll miss opening flaps to see what some beloved wrote. If I go “kindle”, what about all those notes in the margin? How would I be reminded of a special quote shared with a person who loved it equally? I’ll miss the mystery of why some section is highlighted in its entirety. You have me chuckling, David. My imagination may be far worse than your book shelves! I didn’t think I’d show mine, but what do I have to lose? Actually, what I really need to do above all else is paint them. If only I enjoyed doing that sort of fussing and fixing! I’d rather spend my time having a good visit or getting another unit done on my Photo art course! Oh, Rosie, I’m so proud of you! What a grand thing to have done – for the library and for yourself! surely that book case is one that could only be found in a model home. I much prefer yours. It holds not only books but stories – of you. I love that. I am so looking forward to unpacking our books when we get settled and filling shelves with them and with bits of our story. Thank you, Joss! I also prefer going into a home that is being lived in. The ones that sparkle with no telltale signs of life reveal very little about their peeps. Do you mean when you unpack in Central America? Are you actually taking your books there? Wow…that’s quite a feat. 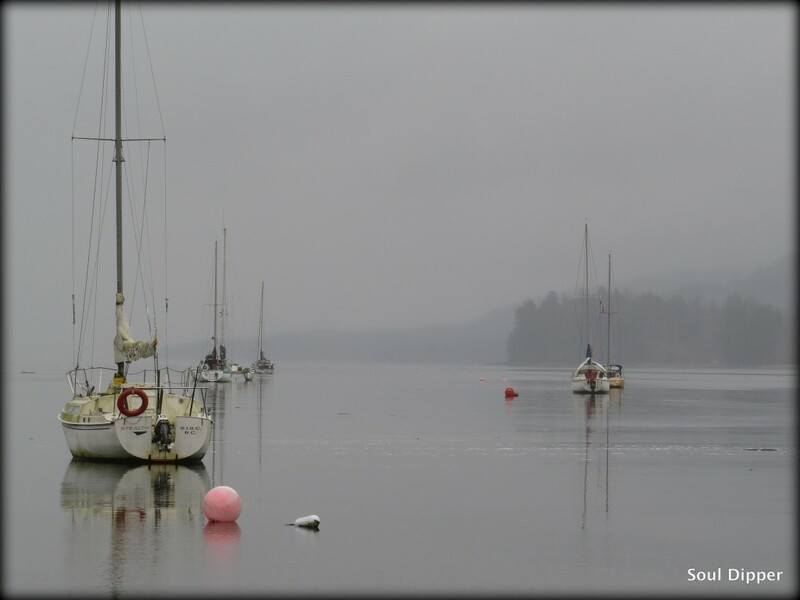 Yes, books and copper pots and pictures and….we are having a container shipped over. What a job! You must be doing a great uncluttering – again – since you downsized before your stint in France. You really are living your dream, Joss! Yes and liking that part of it although I do get a bit overwhelmed, at times, by it all. OMG! I love this. I grew up with a beautiful library … in my home. It was filled with all kinds of books, including the leather-bound library of my grandfather whom I never met. The only thing that I ever wished to inherit from my mother was her library. I left home at 18. I failed to mention that we were NEVER allowed into the library. No one went in. I never understood this but also never gave it much thought. Those were my mother’s ways. Once they each died (mother & father) as executrix I had to empty the house. What a tragedy. The library (in Vermont) had never been either heated or cooled. The books (most) had disintegrated into powder. I was aghast. Funny in my own home I had a library. Called such because of the (really poorly built shelves) massive shelving. But after 31 years – I had emptied it once. I was heartbroken when I moved a year ago and made the decision to leave 1/2 the books there. I did this as a gesture of saving by not buying “many” bookshelves to accommodate the move of all of my books. Today I regret that I did not move them all. Wow – I didn’t know books would simply disintegrate if just left alone. My god – just like people, they need to be touched, loved, moved and cared about! Now you’ve given me a new mystery. Why on earth did your mother keep people out of the library? It makes me think about the things I thought I had to possess. Something always happened to them. As a kid, the special goodies I saved or put away were gobbled up by older siblings or were transformed into something disgusting over time. My most astonishing earrings were so loved by a native woman from Yukon, I gave them to her. I thought I’d be able to replace them – I haven’t been able to. I saved and saved until I could buy a particular amethyst ring that I thought was beyond the Crown Jewels. About two months later, it was stolen from me. On and on. It has taught me to understand that the only thing we truly have is our mind and soul. Speaking of a mother story – my grandmother died when Mom was 16. A very cruel aunt came to look after mom and her sibs. She saw mother’s love of books (mother’s antidote to the grief she didn’t mention!) so made her take the books to the back yard to be burned. The story still breaks my heart. When that aunt came to visit us once when she was in her late 80s, (I was in my early teens) I refused to spend time with her – because of that story! I really wanted to confront her about it and now I wish I had! Amy, you were but a kid, You more than likely could not have done so in a manner that you would have wished. So, we could not go into the library but we had to read ALL the time. We did not grow up with TV. However, David Copperfield at ( years of age was pure hell. And to this day I do not like Dickens. My mother became radically conservative and in the end deemed Dickens a socialist. I just laughed. We also had no TV until I was 13 – though there were a couple of neighbours who indulged my love of Ed Sullivan and Bonanza. Oddly enough, I was a TV star within one year of having TV. Our local TV station had a Teen show every Saturday and my friends went faithfully to dance up a storm. We were given 45s as a gift and would groan over them. They were never by popular musicians. I loathed the horrors that young people endured in Dickens’ books. Could barely get through those parts, but couldn’t avoid them – had to get to a decent outcome. Mom fretted over that Aunt coming to stay for a few days, but there was a very old couple in this small city who were somehow related to this aunt. They longed to see a relative before the end of their lives so mother wanted to accommodate them since they were more “family” than the wretched aunt. When the aunt arrived I was relieved to see her fragility – due to her old age and the tiring trip from California. I saw that mother was in charge, but I kept a watchful eye. Amy, I dig how your shoes keep your books company. Oh, the places they all have been! My books are all over the house: bathroom, bedroom, kitchen, living-room. I even use them as (lifter-uppers) for my lamps! They are shaded with yellow markers, sticky notes, and have broken their poor old spines! Kim, I’m making an attempt to imagine what shoes you’d have lined up. Why do I think stiletto heels and a multiplicity of colour? I truly savoured reading this post of yours. Just like I savour those mothballed memories I hold of my childhood when my biggest motivation to finish that last examination paper before the term end break was the pleasurable thought of curling up under the blanket with all my favourite story books. The book shelf that evening wore a pretty bare appearance! Those were the days when televisions were still a rarity and things like the internet and computer would not have occurred to even the most fertile imaginations…. Fast forward to today and I am hard put to recall when I read a paper book from start to finish! Lovely to hear from you, Friend!